Rachel Brenke is both a lawyer and a professional photographer, and talks about the legal issues photographers should be sure to cover to protect themselves and their clients. As I’m sure you know from your own experience, being a professional photographer is fun, rewarding, creatively satisfying, personally fulfilling, and one of the best jobs anyone can hope to have. And then there’s the other side – the dark side, if you like, that all photographers must deal with if they are to thrive and survive in business. That’s right, it’s the business side that exists in direct contrast to the fun of creating photographs for a living. It’s often said (and true) that success as a professional photographer is about 80% business and marketing and 20% photography, but who got into photography because they love accounting, sales, marketing, SEO and, dare I even say it here, dealing with contracts and other legal matters? Not too many of you, I’m sure. Which is why I asked Rachel Brenke to chat with me about some of the legal issues that you need to address if you want to be seen as a true professional and achieve the success you want. The great news is that Rachel turns this topic into something fun and entertaining, and I thoroughly enjoyed our time together. Rachel Brenke is both a photographer and a lawyer, being a barred attorney with a Masters in Business Administration and a Masters in Human Services. All that, combined with her marketing skills. makes Rachel supremely qualified to help professional photographers to legitimately create successful businesses for themselves. Rachel is well known to many photographers as “The Law Tog“. 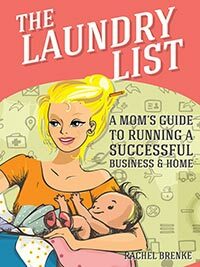 She is also the author of “The Laundry List“, a real-life practical guide to balance family and business. Rachel’s consulting services and training courses have been showcased on national levels with Creative Live, WPPI, Seniors Ignite, and through the Professional Photographers of America.